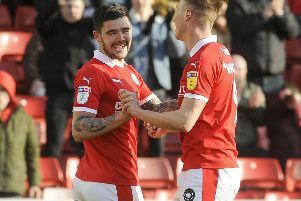 Barnsley proved their squad is strong enough to sustain their promotion push with a 2-0 victory over Accrington that helped them take a firm grip of second spot in League One. 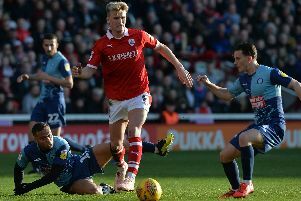 Daniel Stendel's options at Oakwell were hampered by the unavailability of injured top-scorer Kieffer Moore and banned duo Cameron McGeehan and Jacob Brown. But the trio's absence failed to unsettle the Reds as an effort from Dimitri Cavare and a Will Wood own goal moved them four points ahead of third-placed Sunderland, extending their unbeaten league run to 16 matches. Jordan Green profited from Brown's suspension with a start and went close in the fourth minute, having a shot blocked following a fine run from Dani Pinillos. Stanley did their best to slow the hosts down, taking their time at every opportunity, but Barnsley continued to create chances. In-form striker Cauley Woodrow shot wide and then Pinillos had an effort saved by Jonny Maxted. But Barnsley had to be alert at the back and, as per, Adam Davies made a fine double save from close range to keep Stanley at bay on his 200th appearance for the club. However, the visitors could not contain the Tykes for much longer as they struck twice in the final four minutes of the first half. Cavare was set free by Woodrow's fine through ball, coolly slotting beneath Maxted, before Mamadou Thiam's cross was missed by the goalkeeper and turned in by Wood after Alex Mowatt had fired wide. Green almost put the game to bed four minutes after half-time, cutting inside and drilling a left-footed shot against the post. Barnsley were knocking on the door for a third and Maxted had to be at his best to keep out a Liam Lindsay header from a Mowatt corner. Accrington almost set up a nervy last 10 minutes, substitute Paul Smyth firing wide after breaking the offside trap, while Maxted made another fine save to tip Mike Bahre's effort behind for a corner at the other end. The Reds managed the game superbly to claim a fourth consecutive clean sheet and take full advantage of Sunderland's slip-up at Wycombe. Barnsley: Davies, Dougall, Pinnock, Lindsay, Woodrow, Cavare, Green (J Williams 59), Bahre (Hedges 87), Thiam (Styles 81), Pinillos, Mowatt. Subs: Walton, Jackson, B Williams, Adeboyejo. Accrington: Maxted, Johnson, Hughes, Donacien, Wood (Smyth 53), Rodgers, Clark (Zanzala 69), Barlaser, Finley, McConville, Armstrong (Kee 58). Subs: Savin, Richards-Everton, Brown, Sousa.